Do you have any news to share? Contact us and read your news here. 28 November 2018 - Looking back to a very informative Day of Photonics led by the enthusiastic professionals of Phillips Research. Thanks for your hospitality and see you all next year! 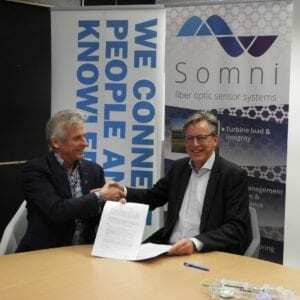 27 November 2018 - Somni Corporation B.V. and research institute TNO today signed an agreement that allows Somni to use TNO patents for new, innovative fibre-optic sensors. 12 October 2018 - Fraunhofer Project Center at the University of Twente is our newest member. They support industry in application-oriented system solutions covering from product development, production processes and maintenance to digital designs and factories. We look forward working with them! 27 September 2018 - Our newest member, PHIX Photonics Assembly, is a start-up located in Enschede. PHIX supplies the photonics industry with assembly and packaging services for Photonics Integrated Circuits. The main challenge for combining the PIC platforms is in the hybrid integration of the various PICs in one package. The main focus of PHIX is to supply PIC manufacturers for assembly of their PICs and package them into qualified modules for their OEM customers. We look forward to a pleasant collaboration! 11 September 2018 - With just a few booths available our Holland Avenue at PhotonicsWest 2019 is about to be completely filled. Increase your visibility at the world’s largest annual photonics technologies event. Please contact us for reserving the last booths. 13 July 2018 - Today the 'Nationale Agenda Fotonica' (National Agenda Photonics) has been presented to the State Secretary of Economic Affairs and Climate, Mona Keijzer by Benno Oderkerk, chair of PhotonicsNL. This agenda came about in cooperation with PhotonicsNL, DOC and PhotonDelta. 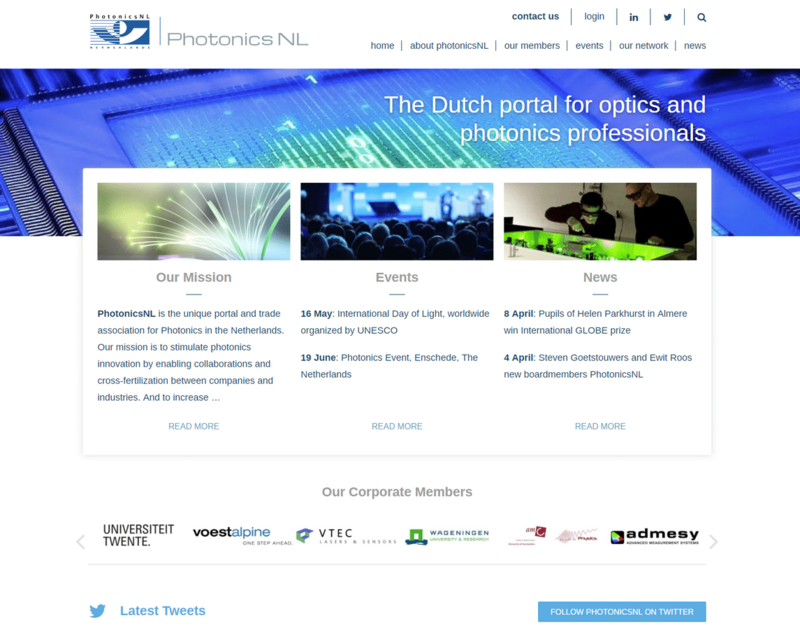 On the page 'Photonics in the Netherlands' you can read more and download the Dutch and English versions of the NAF. 3 July 2018 - Magic Micro, a Kosdaq-listed South Korean electronic component company, has acquired a majority share of 75% in LioniX International, one of our members. Read the press release on the website of LioniX International. 2 July 2018 - Sumipro BV is our next new member and we are very delighted that they are part of our association now. Sumipro have their office in Almelo. They are a manufacturer of custom made high precision optics. Take a look at Sumipro's website. 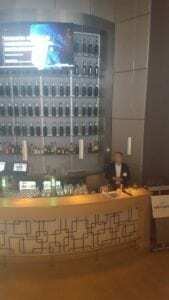 20 June 2018 - One day after the event we look back to a very successful Photonics Event. With The Gallery at Kennispark Twente as a perfect place to have this event taken place there was a cozy atmosphere and much activity in the different rooms where the various program was being held. We thank all the speakers, exhibitors, participants, and visitors and we hope to see them again at our 2019 edition! 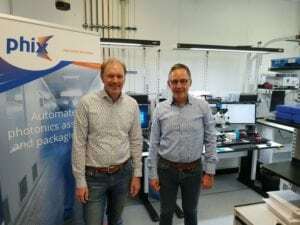 19 June 2018 - With the realization of a packaging machine for fiber arrays in Twente the photonic industry is a big step further on its way to mass production and assembly of chips. 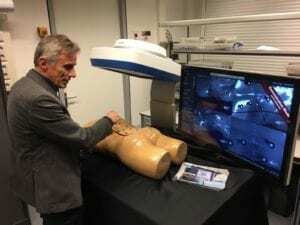 Fraunhofer Project Center at the University of Twente and PHIX Photonics Assembly have been working together in developing the technology for this machine. 27 April 2018 - We are very happy to welcome our new member NTS Optel BV. NTS Optel is based in Nijmegen and is specialized in providing customized high-tech solutions that involve optical elements. Visit them on the website of NTS Optel. 26 April 2018 - PhoeniX/Synopsis are host of the newest PIC training. Get an overview of the latest status of the integrated photonics eco-system for the three major photonics technologies: InP, silicon photonics and TriPleX (SiN), including the available design tools today and the importance of considering test and packaging in an early stage. Read more on the website of PhoeniX Software. 19 April 2018 - This year PhotonicsNL celebrates her 5th anniversary. 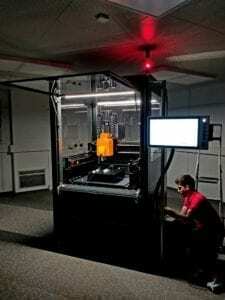 5 years in which photonics has become more and more important. 5 years of big challenges and changes. We therefore updated our website completely. And we are very proud of the result! As you will see our members are involved as well. Share your news, vacancies and social media messages on our website. Together we can expand our website and network from here. 8 April 2018 - On 6 April pupils of Helen Parkhurst in Almere have been selected by the international GLOBE program as the winners of the yearly Virtual Science Symposium. They will receive financial assistance to join the GLOBE Learning Expedition in Ireland in July. They will present their research about the influence of firework on the aerosol concentration in the air to an international audience of pupils, teachers and scientists. 4 April 2018 - During our General Member Meeting of 3 April our members have chosen two new board members. 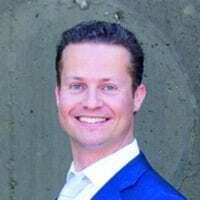 We welcome Steven Goetstouwers of Admesy and Ewit Roos of Photon Delta to the board. They are very enthusiastic about joining the board and we wish them a valuable time with us. 3 April 2018 - Hosted by Radboud University our first Day of Photonics of 2018 has been a huge success. Starting the day with different presentations about the work of the university. After a very delicious lunch we were shown around in the interiors of the diverse labs Radboud University features. Thanks to colleagues, their students and PhD's it's been a very inspiring day! 30 March 2018 - We welcome our new member PI Benelux. Take a look on the website of PI Benelux. 2 January 2018 - May we introduce you to our new director: Ron van der Kolk. Ron will start today at PhotonicsNL and will succeed Guus Taminiau, who will retire in advance on 1 March. After having studied Business Information Technology at the University of Twente he worked in several companies in marketing, strategy, managing and professionalizing of teams and optimizing business processes. Within his role as director of our association he wants to combine this knowledge and experience with his passion for (new) technology. We wish Ron a pleasant time at PhotonicsNL!